PETALING JAYA: See Hoy Chan Holdings, the developer of Bandar Utama township, is planning to venture abroad to widen its revenue base. Director Datuk Teo Chiang Kok said going abroad is a natural progression for the group, especially since conditions for developers in Malaysia are getting tougher. Teo, in a recent interview with Business Times said countries under its radar include Indonesia, Vietnam, India and secondary cities in China. "It could be an entire township or just an office building ... we are still exploring. It is a natural progression to look beyond our borders," Teo said. According to him, the property development environment in Malaysia makes it difficult to obtain sizeable landbank. Its Bandar Utama land, for example, covers 405ha. Teo added that the requirement for allocating low cost housing, cross subsidies for utility companies, Bumiputera quotas and discounts add to the cost of housing and reduces yield. "We will go where opportunities are better and where things can be developed more efficiently. In India and China, return on investment is faster and better," he said. 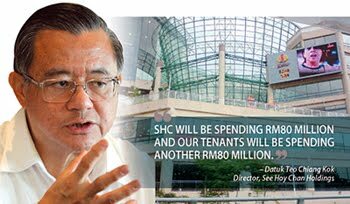 SHC is also interested in participating in the 1Malaysia Mall projects proposed under the Economic Transformation Plan, that aims to take Malaysian retailers and mall operators abroad. Besides houses, the Bandar Utama development also houses commercial properties, which includes the 1Utama Shopping Centre, Plaza IBM, KPMG Tower, the five-star One World Hotel and the 1 First Avenue office. The next development on the cards is for a four-star 450-room hotel and a convention centre with some 18,000 sq m space. "We will submit the proposal for approval by year-end and it should be ready within three years," Teo said. The convention centre will be built in such a way that it will be connected to the new hotel as well as to two more office towers, each 30-storey high. Beyond that, the plan for Bandar Utama includes the establishment of a hospital for which a 3ha site has been set aside. And next to the hospital are plans for the setting up of a retirement village. Meanwhile, Teo, who had previously not been keen on floating its shares on the stock exchange, is now open to the possibility of listing a real estate investment trust (REIT). "We have been approached to look at REITS. (The setting up of) REIT looks interesting, but in terms of timing, we are not there yet ... we need our commercial properties to mature a little more and reach critical mass," he said. He added that the properties could take another three to five years to mature and the company needs a few more buildings, within or outside Bandar Utama. KUALA LUMPUR: N2N CONNECT BHD is acquiring an 11-storey office building in Bangsar South for RM36 million cash to be partly used as its office space, and to be let out to third party tenants. In a filing Monday, June 6, N2N said it had entered into sale and purchase agreement with Bangga Istimewa Sdn Bhd to acquire the building known as Block 6 (Type G) as the The Horizon, Phase 1 in Bangsar South. N2N said it planned to occupy four storeys of the property for its own use and rent out the remaining floor space to third party tenants. “Based on conservative management estimates of current office rental rates in the vicinity of the property of RM5 per sq ft per month, it is estimated that the rental income to be generated is approximately RM1.76 million per annum, assuming the leasing out of the entire seven storeys of the property to third party tenants,” it said. N2N said it would finance 75% or RM27 million of the purchase price via borrowings, while the remaining RM9 million would be through funded internally. The company said the The Horizon, Phase 1, was a commercial development comprising 14 blocks of 11-storey stratified office buildings erected on a three-level basement car park. The entire blocks of The Horizon, Phase 1, are MSC-compliant and completely broadband enabled, it said. “The Horizon, Phase 1, forms part of the ongoing integrated township development known as Bangsar South. “When fully-developed, Bangsar South will consist of Grade-A offices, retail avenues, boutique condominiums, service suites, a clubhouse and a boulevard,” it said. N2N said that acquisition would provide it savings on its current rental expenses; a hedge against future increase in rental expenses; potential capital gains arising from the expected appreciation in value of the property; and secure sufficient office space to cater for the future expansion of N2N to be housed all under the same roof as the property is designated as a MSC Malaysia Cybercentre. “It is a conducive environment to promote growth of N2N as a MSC Malaysia status company,” it said. KUALA LUMPUR: Noor Arfa Holdings Sdn Bhd, a pioneer in the batik industry in Malaysia, is planning to venture into property development and hotel management in the near future. Its founder, Wan Mohamed Ariffin Wan Long, said that the move is necessary as its core business - manufacturing batik and selling handicrafts - has seen a sharp fall in recent years due to the shortfall in tourist arrivals. 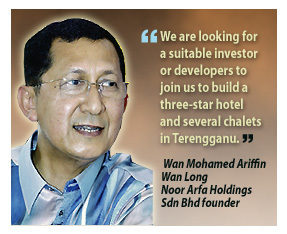 "We are looking for a suitable investor or developers to join us to build a three-star hotel and several chalets around the area at our main showroom in Chendering, Kuala Terengganu," he told Business Times in an interview recently. Wan Mohamed said the company has over two acres of empty land, which would be ideal for such development. However, it is having a tough time finding the right developer to partake in the project. "We plan to jointly develop the area with the developer, and the breakdown on how we plan to do this will be finalised once we find the right developer to work on this project," he said, adding that a RM20 million investment would suffice for a start. 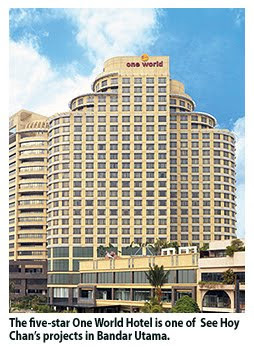 Although there are many three- and four-star hotels around the area where Wan Mohamed plans to build his own hotel, he is confident that it would be a hit because of the tourism activities that his place has to offer. "My place is right next to a river bank (which leads to the South China Sea), there is a nice restaurant here where tourists can do all sort of activities like weaving songket, chanting batik and also shopping for handicrafts (at the showroom). The other hotels don't have that sort of facilities," he said. Wan Mohamed said his son had approached the Tune Group for a joint venture only to be turned down by the latter as they only set up hotels next to airports. Wan Mohamed, who started Noor Arfa along with his wife Noor Hijerah Hanafiah in the 1980s, said a lot has changed since the yesteryears as today, not many Malaysians put on the importance of donning the batik. This, he said, is slowly eating into his profits. "These days, even the civil servants are not following the Thursday rule of wearing batik to work like they once used to," he lamented. He said the lack of tourism activities or big events like "Visit Year" in Terengganu and the country is also affecting the sales of his batik goods. "Even the East Coast Economic Region has failed to bring in any sort of development or tourism activities in this area," he said. Wan Mohamed has two showrooms located in Kuala Terengganu and Malacca, and few other stand-alone shops in Kuala Lumpur. 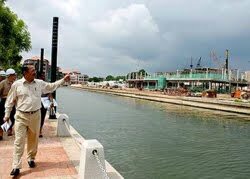 "Now, many travel agents fly the tourists to the islands and completely bypass Kuala Terengganu. This was not the practice before," he said, adding that Singaporean tourists used to be the biggest spenders back in the good old days. Asked whether his company plans to be listed on the local bourse, he said that there are many things that need to be ironed out internally before such a plan could take place. "We did plan to go for listing in year 2000 but at that time, our sales were clocking in at RM16 million a year. Last year, we only made RM10 million in sales and the year before that (2009), it was around RM12 million. I am afraid that this year will be even worse that last year's performance," he said.